The patient was exposed previously to enoxaparin, with a time course consistent with rapid-onset HIT. 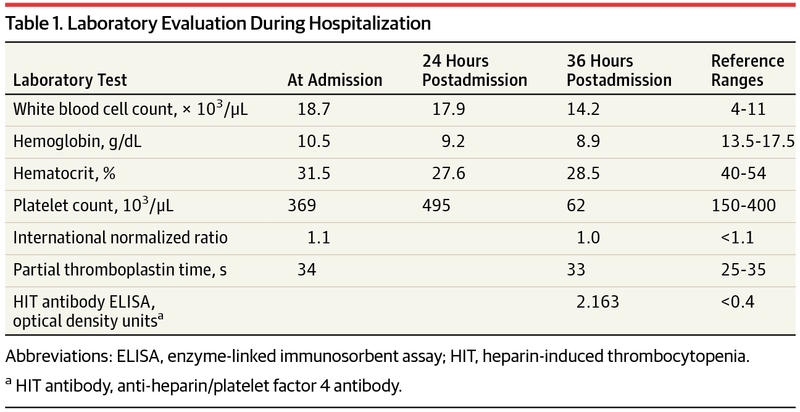 Given the high clinical suspicion for HIT (4Ts score, 6), heparin was discontinued. The HIT antibody IgG ELISA was positive with 2.163 optical density units, consistent with HIT. The patient was treated initially with argatroban followed by fondaparinux once the platelet count was 150 × 103/μL. Warfarin was not prescribed because of concern for poor absorption following the bowel resection. After a 1-year hospitalization, the patient died of fungemia unrelated to HIT. When heparin-induced thrombocytopenia (HIT) is suspected, pretest probability should be assessed using the 4Ts score. For those with a 4Ts score greater than 3, enzyme-linked immunosorbent assay (ELISA) should be used to screen for HIT antibody. Heparin should be replaced with a nonheparin anticoagulant. Positive HIT antibody ELISA should be confirmed with serotonin release assay or a high-dose heparin ELISA. Patients with confirmed HIT should continue taking a nonheparin anticoagulant until the platelet count normalizes.